After a great meal in Mystic we made our way north to our hotel. We weren't staying in Boston proper. We were staying in Lexington at our favorite hotel, Aloft. The hotel is right off of 95 so it is an easy trip to the various points around Boston. After a good night sleep and a swim in the pool we were ready for our first day in Boston. We headed into town for a classic activity, walking the Freedom Trail. We parked off of Boston Common and got our bearings. It was another beautiful day. We walked through Boston Common and Boston Garden, letting the kids run and taking some family vacation snapshots. Karen and our friend Carolyn were on a mission to get on one of the guided tours of the Freedom Trail with someone dressed in period garb. Knowing that this would be the perfect combination of fascinating history and child torture, I suggested we have lunch before we embarked on a journey back in time. Of course, I had just the place in mind. The week before we left I had read a fun piece in the New York Times by Ben Shpigel. He wrote about his experience as a baseball writer and discovering great food in the baseball towns he travelled to while covering the Yankees and Mets. In Boston his go to spot was The Parish Cafe. That was where we were headed. The Parish Cafe is located right off the Boston Public Garden on Boylston Street. It has a lovely, raised outdoor patio out front for eating and people watching on nice days. Inside it is a large, long room with some seating up front, a long bar dominating the middle of the restaurant, and the main seating area in back. The restaurant can easily handle large groups. We were a group of seven and there was a group of seven behind us and they had us all seated within ten minutes. The Parish Cafe opened in 1992 and has been voted best sandwich in Boston almost every year since. The concept is a unique one. The owner approached a number of famous Boston area chefs and asked each to design a sandwich for the menu. The result is a deep list of sandwiches, most of which are unique takes on classics. These are not your standard deli fare. These are sandwiches of note and renown. The menu also has a number of appetizers, salads and main courses on offer as well, but the sandwiches are the headliners. Seeing as how we were on vacation, a nice beer at lunch seemed a good place to start. 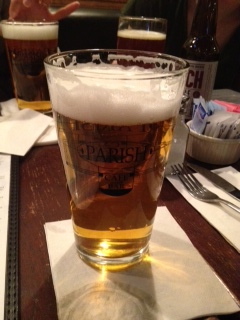 The Parish Cafe has a good and interesting selection of beers on draft and in bottles. Carolyn and I opted for the Victory Prima Pils, a nice crisp pilsner out of Pennsylvania. 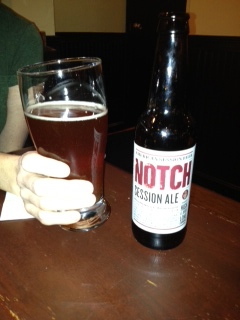 Karen went with a Notch Session Ale. Notch is a local brewery out of Ipswich, MA that specializes in "session" brews. Session brews are traditionally beers lower in alcohol than your standard beer. Notch defines anything with a 4.5% or lower alcohol by volume a "session" beer. There is no real definition of a "session" brew and there seems to be a heated debate over this in the craft beer world. Just know that Notch Session Ale Karen had was delicious. Rich, with a deep amber color, this ale is malty with a little chocolate and will satisfy any fan of darker ales. And it is only 4% ABV to boot. Thin sliced breaded and pan fried eggplant on a sesame torta roll with slow roasted black beans, chipotle aioli, avocado, and Oaxaca Mexican cheese. Served with chipotle Mexican slaw. They enjoyed both of them. 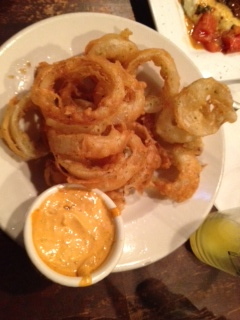 I knew I wanted to try the Bowl-O-Rings, homemade, beer battered fried onion rings with a chipotle aioli on the side. I did, and I was pleased. Thick cut onions, lightly battered and fried, they were what you always hope onions rings will be when you order them. The chipotle aioli was rich and spicy and will make you banish ketchup as a onion ring condiment forever. I love lobster. I love lobster rolls. And I have been spoiled because I have spent quite a bit of time in Downeast Maine with my in-laws. I have bought lobsters from the back of a lobster boat in Corea, ME. So it takes a lot for me to get lobster south of Portland because I have been spoiled. I am happy I took the plunge here. 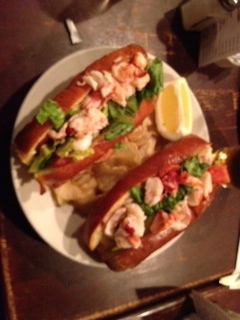 As you can tell from the photo, this is no ordinary lobster roll. It is, in fact, two lobster rolls. Decadent. I can't tell you how many times I have eaten a lobster roll and wished I could eat another one. My wish came true. Two lobster rolls with a side of Cap Cod Chips. Perfect. However, there is more than meets the eye here. These are not quite your traditional lobster rolls. The do have some of the keys to a great roll. Big chunks of lobster, barely touched by mayo. Buttered and grilled split hot dogs buns, in this case they are twice the size of a normal hot dog bun. What you cannot see is what is underneath the lobster. Chopped romaine lettuce, tomato confit, Hellman's mayo, and applewood smoked bacon. In a nutshell, what you get is an oversized toasted hot bog bun with a BLT on the bottom and a lobster roll on top. And you get two of them. And chips. It is, to coin a phrase, wicked awesome. Two meals, two (actualy three) fantastic seafood rolls. I was on a roll (yeah, I know, I know. At least I didn't make a "brewhaha" joke before). We were ready for a good walk, a history lesson, pushing the tolerance level of our kids. Boy, did we get it. The Parish Cafe is a must when you are in Boston. Great location, great food, great spot to refill and recharge. Perfect for the whole family.